The project to connect the remote First Nation to the power grid is due to be completed in November. 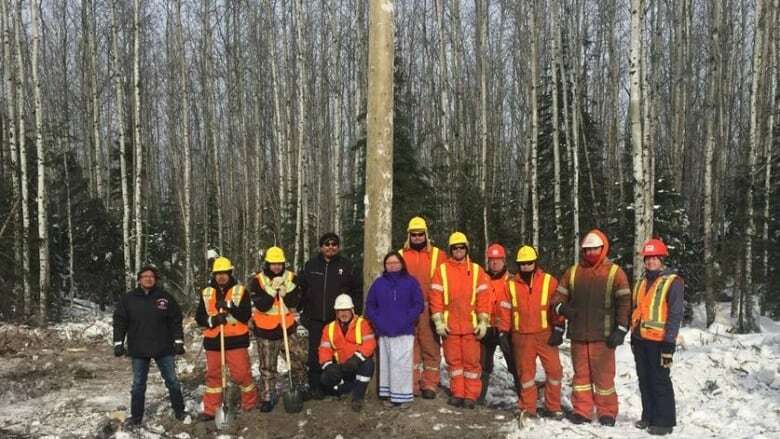 Contractors have installed the first pole in a power line that will connect the remote First Nation of Pikangikum to the power grid near Red Lake, Ont. The 117 kilometre line is due to be completed it mid-November. The placement of the first pole marks an "amazing milestone," said Mike Jardine, the chief operating officer of Wataynikaneyap Power, which is building the line. "As most people may know, this is the start of a major project to connect 17 First Nation communities, so this is the first one, and it's an exciting milestone, and we're certainly looking forward to getting each community connected." The team plans to connect Pikangikum to the substation south of the Berens River before the winter road breaks up in the spring, Jardine said. Right-of-way clearing for the line began last month, he said, and the community has been free to use logs not suitable for marketable timber as free firewood. Approximately 70 or 80 crew members are currently working on the line, Jardine added. As of two weeks ago, seven community members from Pikangikum were part of that crew. Like many remote First Nations, Pikangikum currently relies on diesel generators for its power and has suffered from rolling blackouts during the winter. The lack of reliable power also curbs home construction and economic development activities.